These forcing vases are specially designed for forcing hyacinths or paperwhites. Simply fill with water and set the bulb on top. Forcing instructions included. Make great gifts! Makes an excellent gift idea! We can direct ship to your list. 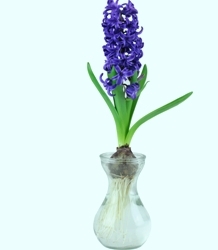 The above Forcing Vase Kit comes with a vase, one Paperwhite bulb and one 'Delft Blue' Hyacinth bulb per vase. Plus a nice 6x6x6 box, ready to wrap. These vases are specially designed for forcing hyacinths or paperwhites. Simply fill with water and set the bulb on top. We recommend starting the Paperwhite upon arrival, and storing the Hyacinth in the refrigerator for later blooming. Forcing instructions are included. To order additional Hyacinth bulbs, click here. To order additional Paperwhite bulbs, click here. Bulbs available from late August through December. 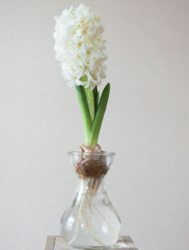 These forcing vases are specially designed for forcing hyacinths or paperwhites. Simply fill with water and set the bulb on top. Forcing instructions included. To order Hyacinth bulbs, click here. To order Paperwhite bulbs, click here. Beautiful ceramic paperwhite bowl with painted Dutch design is a unique gift idea. 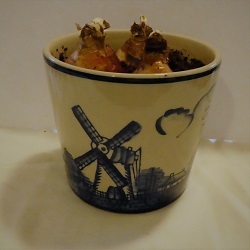 Comes with 3 paperwhite bulbs, a soil block, and instructions for planting.